You are many things. You are a muscle mover, blood pumper, thinker, calorie burner and nutrient user. You are all these things and much more! You're a walking, talking, munching, crunching person. You are on the move. Measure your fitness balance. When you finish an activity, write the date you did it on the back page. Kids should get 60 minutes of physical activity on most days of the week. Try to eat smart so you can play hard. You are many things. You are a muscle mover, blood pumper, thinker, calorie burner and nutrient user. You are all these things and much more! You’re a walking, talking, munching, crunching person. You are on the move. Let’s analyze a day with YOU. 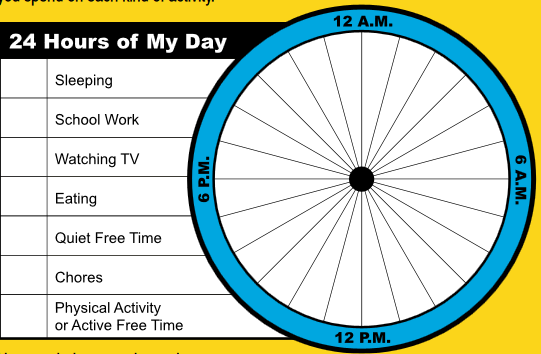 Activity 1: What’s in Your Day? Choose a color or draw a pattern in the box for each activity. Use your color or pattern to fill in the amount of time you spend on each kind of activity. The last time you looked in the mirror, you probably did not look like a hamburger, broccoli, a bowl of soup, a slice of pizza and a piece of chocolate candy. But in a way, you are all these things. That’s because the food you eat really and truly does turn into you. That means skin, bones, brain, blood, muscles and nerves. Now that’s amazing! What Happens to Food After You Swallow It? Food slides down a tube called your esophagus. First it visits your stomach. Then it moves on to your small intestine. In both places, special juices break down the food into very tiny particles called nutrients. The nutrients are so small they can enter your blood stream. Your blood takes them to every part of your body to feed its 100 trillion hungry cells. Why Do Body Cells Crave Nutrients? Why Are There So Many Different Nutrients? Different kinds of cells make up different parts of your body. They need different nutrients to do their different jobs. A team of about 50 nutrients works together to keep you looking and feeling your best. Protein helps build and repair your cells. Carbohydrate provides energy to work and play. Vitamin A helps your skin stay healthy and helps your eyes be able to see in the dark. Vitamin C helps your cuts and scrapes heal. Does Any Food Have Every Nutrient? No single food has all the nutrients in the amount people need. That’s why we need to eat many different kinds of food every day. What If I Don’t Eat the Nutrients My Body Needs? You probably won’t have lots of energy. You might not have healthy skin, hair and nails. You may get sick. And getting better may take longer. 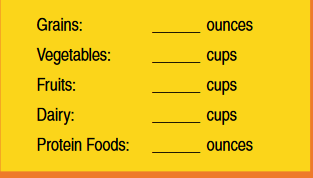 Activity 2 (optional): What’s Your MyPlate Plan? Do this activity, then track the foods you eat for two days. If you don’t have a computer at home, try going to a library or another place in your community with computers available for the public. Check with a parent first (or have your mom or dad join you). Are you eating fruits and vegetables? Are you choosing lower-fat or fat-free options in the dairy group? Repeat this mission with your parent or caregiver to find his/her plan. 1. What food belongs in the MyPlate Grain Group? What color is the Grain Group? 3. Which MyPlate food group includes meat and beans? 4. Which food group contains foods such as lettuce, broccoli and peas? 5. What color on MyPlate stands for the Fruit Group? Almost any nourishing food can be a snack. Here are simple snacks from several of the food groups. Any more bright ideas? Whole-grain cereals are great anytime, not just in the morning. On a cold day, fix a steaming bowl of soup and sprinkle it with croutons and grated cheese. Build a super sundae with frozen yogurt, fresh fruit and chopped nuts. Munch on carrot sticks when you curl up to read a book. Try ants on a log. Stuff celery with peanut butter and place raisins on top. Raisins are high in iron, a mineral young people find hardest to put in their diets. Activity 4: Make a Healthful Snack. See the websites below to watch food demonstration videos and to find recipe ideas. The recipes include ants on a log, granola bars, apple peanut butter bites and snack mix. Your body has more than 600 muscles. Why so many? Muscles are what make you move – arms, legs, fingers, eyelids, everything. The more your muscles move, the better they are at moving you. Fill in the table below now and in one month. Be sure to practice to see if you can improve your fitness level. How strong and flexible are your muscles? Record the number of bent-knee sit-ups you can do. Measure the distance you can throw a ball. How many toe touches can you do? How long can you keep moving without getting tired? Work with an adult and see how far you can walk and run in five minutes. Count how many times you can jump rope without getting tired. Did you know that kids should get 60 minutes of physical activity on most days? It’s fun, too. When you’re fit, your calorie intake equals your calorie output. When you take in more calories than you use, your body changes them to fat. What do you do then? You can watch what you eat to lower the in-calories. And you can exercise to raise the out-calories. This usually means snacking a little more wisely and sitting around a lot less. A calorie is a measure of the amount of energy that food contains. Foods (except water) contain different amounts of calories, and activities use up different amounts of calories. You can see the number of calories in a serving of food by reading the Nutrition Facts label. We burn different amounts of calories depending on our age, weight and whether we are male or female. In the next 24 hours, list on a separate sheet of paper what physical activities you do. Using the list below, about how many calories did you burn? You may have to do some math since these numbers are per hour. How Many Calories Can You Burn Per Hour? 1. If you spend five hours watching TV, about how many calories would you burn? 2. If you go on a two-hour hike and you walk fast, about how many calories would you burn? Visit to learn more about nutrition and fitness. Remember to Eat a Variety of Foods Every Day!